There's been a change at the helm of the Spanish hierarchy: earlier today, Cardinal Antonio Maria Rouco Varela of Madrid was elected the new head of the nation's episcopal conference. 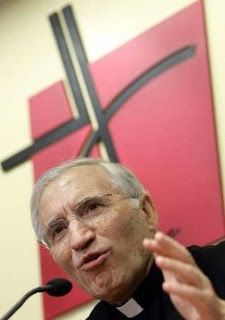 Oft-described as the leader of Spanish Catholicism's conservative wing, the 71 year-old cardinal -- a highly-regarded canonist -- replaces the "moderate" bishop of Bilbao, Ricardo Blazquez, who had sought re-election. The Madrid prelate had held the presidency for two prior terms, from 1999 to 2005. The election attracted a significant amount of attention in the Spanish press, which played up the choice between the two prelates as a barometer of the episcopate's political leanings in advance of Sunday's general election. In the midst of the heated campaign season, the bishops had already released a pre-vote pastoral which had been interpreted as a swipe at the governing Socialists -- a move which saw Prime Minister Jose Luís Zapatero seeking recourse over a three-hour dinner meeting with Madrid's papal nuncio, Archbishop Manuel Montiero de Castro, which took place at the premier's request. Named to Madrid in 1994 and a cardinal in 1998, Rouco is just the latest example of a recent global trend that's seen large episcopal conferences returned to the oversight of cardinals. Just within the last six months, Cardinal Andre Vingt-Trois of Paris was elected president of the French bishops, Syro-Malabar Cardinal Varkey Vithayathil was tapped to head the Indian conference and, of course, the US bishops chose Cardinal Francis George of Chicago as their first red-hatted leader since 1971.